Digital marketing is critical for your small business. 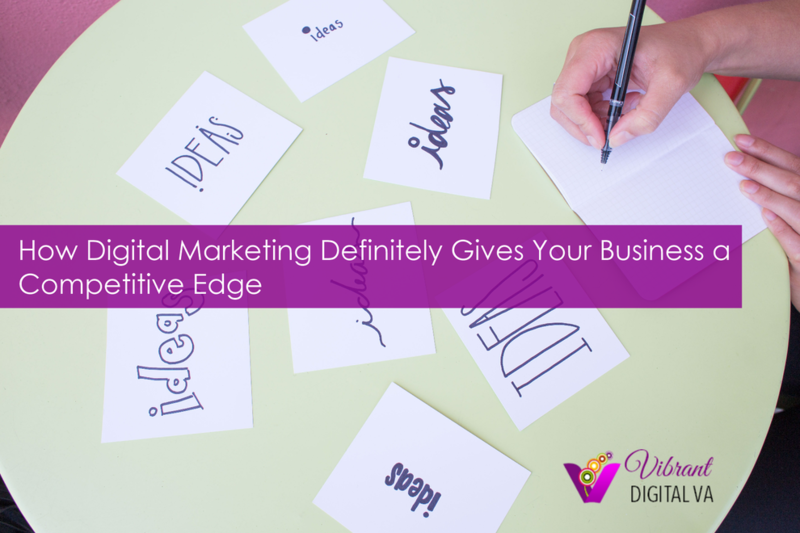 Digital marketing can be overwhelming – and it’s constantly changing. But if you don’t join in, you’ll be left behind and your competitors will gain the advantage. Social media is the top marketing channel used by small businesses. According to a study conducted by BIA Kelsey, more than three-quarters (77.6%) of small and mid-sized businesses use social media as their primary marketing strategy. But, less than one-third (32%) seriously invest in digital marketing – giving your business an opportunity right now. When it comes to digital marketing, one thing I hear small businesses often wonder about is how can they compete with large companies who have big budgets and lots of staff. The answer in one word. Strategy. Small and mid-sized businesses have to be strategic about how they approach digital marketing. In this 15-part series about digital marketing strategy, we are going to deconstruct digital marketing strategy and give you some pointers how you can develop your own competitive digital marketing strategy. Digital marketing strategy and planning is not an overnight activity. It requires a serious investment in time, effort and creativity. And, once you have your competitive strategy developed, you will be in a position to leverage that strategy to invest in marketing your business to achieve the highest ROI possible. Here are the 15 steps to a competitive digital marketing strategy - and how you can compete in today's marketplace using online marketing strategies. 1. Have you set clear, measurable goals? When it comes to marketing your small business, there are lots of strategies and tactics that can be used. The more complicated your marketing, the more it will cost. In order to keep your investment low and get the best ROI, you need to focus on your goals and outcomes. What is the number 1 thing you are trying to achieve? Are you trying to increase brand awareness? Drive traffic to your site? Generate leads? Generate sales? All of the above? Start by getting crystal clear on the result you’re looking for. 2. Are you leveraging the power of social media for listening and learning from your audience? One of the most powerful ways social media can benefit your business – and give you a competitive edge, even over big business – is to use it to research and “listen” to your customers. Used right, it can help you hear and act on opportunities that will delight your customers better or help you identify a competitive niche. It can also help you recognize and address issues with your online reputation. How well is your business using the power of the internet to research and listen to your target audience? 3. How much money should you spend on digital marketing? 4. Do you have an irresistible offer? The internet is a noisy, busy place. There are tons of distractions and competition for the attention of your customers. Your offer has to be so attractive that it stops your potential customers dead in their tracks and makes them want to learn more. Is your offer irresistible? 5. Can your business fulfill on your offer or upsell? Here’s the thing. Marketing is an essential part of doing business. But you have to be careful because if you invest (and you have someone who knows how to do it right), you WILL bring in new business. Is your business ready to handle an influx of customers? Do you have a plan in case your business scales quickly? Just make sure you are ready! 6. Are you clear about who you’re marketing to? You have to know who your ideal customers are. You have to know their deepest desires, what obstacles they are encountering, and how your offer is the perfect solution for them. 7. Do you have a compelling message? When it comes to marketing, messaging – and how you communicate that message – is EVERYTHING. Your message is how you communicate your unique position in the marketplace. If your message isn’t clear and confident, people won’t “get it” and respond. You have to start from where you are. What digital marketing assets do you have in place already? What is the quality of your online presence? Do you have a sales funnel in place? How well is it working? Your website is your key online property. You can drive traffic to it all day and all night, but if it isn’t able to convert that traffic into leads and /or sales, it isn’t working for you. How do you know if your website is ready for you to drive traffic to it? What are the do’s and don’t’s of an effective website? 10. Do you have a sales funnel? Have you built an online sales funnel? What does your customers’ buying journey through your sales funnel look like? Do you have all of the pieces of a successful marketing funnel set up and functioning? Consumers no longer will tolerate being “sold to.” So, as marketers, we have had to change our tactics. Interactive technologies (think mobile devices), evolving media consumption and a growing demographic diversity have made content marketing essential for most businesses. How well is your business performing when it comes to content and media on your website, social media, blog, etc? 12. Are you using social media for your advantage? Are you marketing on the right social media channels? How do you know? How many should you be focusing on? What’s right for your business? Are you harnessing the power of social media marketing for you business? More and more, online marketing is becoming a “pay to play” world. Are you ready to jump in and make use of digital advertising opportunities? How much should you spend? How can you keep your online marketing costs down while still achieving your goals? 14. Do you have a consistent email marketing (and autoresponder) strategy? Email marketing is the #1 way to generate leads and sales using digital marketing campaigns. Do you have an autoresponder set up on your website and social platforms to capture email addresses and build your subscriber list? Do you have a drip campaign that engages and excites your potential customers? How effective is your ongoing email campaign? 15. Are you taking advantage of the evaluative data capabilities of digitization? Understanding your customers, their behaviors, the effectiveness of your marketing and how well your strategy is working are all compelling reasons to track, measure and analyze your metrics. Marketing is an art – and a science. Gathering and analyzing data for your company will make all the difference in the success of your online marketing efforts.